SO MANY PRETTY FLOWERS... ENJOY THIS ADVENTURE PILGRIM... SHIFT+ARROWS TO SHOOT, ARROWS TO MOVE. SOUNDTRACK is HERE including ptf and WAV. Original Tracks, Tracks used: Tealgun, wrenchbaron, and bigrose. 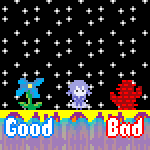 There's a little bit of plot and background but it sort of fades away as I decide to make it more ambient since most ZZT-style games contain too much. Made by Jacob and Sergio! Woo.